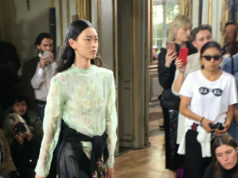 Last week, Paris Fashion Week saw the looks from the Men’s Shows for the Fall 2019 season, and now, Haute Couture fashion is kicking off this week. Here’s an overview of the array of inspiring looks that hit the catwalk modeled by dashingly good looking male models from across the globe. A number of the PFW Menswear shows were rescheduled, due to ongoing Gilets Jaunes protests. Dior rescheduled its original Saturday show, as protesters were expected to be out and about in Paris. But, celebrities could – thankfully – not be deterred by protesters or the threat of them. Rapper Offset was praised for his fashion sensibility during the week, and dubbed “Best Dressed Man at Paris Fashion Week,” by some. His bold and original looks were a nice addition to the street fashion found on the other side of the runway. But, then again, he even appeared on the runway itself, walking the runway at the Off-White show. This proves, yet again, how fashion and celebrity will forever go hand-in-hand. The biggest talk of the town, however, was Hedi Slimane’s debut showing for fashion house Celine. 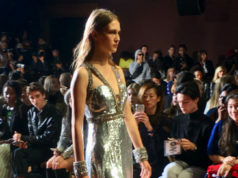 Held at Place de la Concorde, the Celine brand (a Parisian favorite) touted new, exciting looks. The show was reported to be the “most highly anticipated show of the season.” Like most fashion shows worth their weight, star power could be found at the show in the form of rocker-singer Courtney Love. Celine, known primarily for its clothes for women, did not disappoint. “Clean silhouettes that riffed on the ’60s included a checked coat in luxuriant-looking wool or a slim tweed coat. Color was used sparingly,” reported The Washington Post. Hedi Slimane is known as a “rock star of menswear,” and his Celine debut lived up to that moniker. The Dior male models shared their beauty routines with eager readers, and their regimen is clearly an effective one, as the lookers shined on the runway in amazing looks from the iconic fashion house. 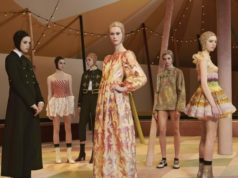 (And the Dior Haute Couture show from this week has already caused a stir with its “circus” look.) For the Dior Men Fall 2019 show, it was a collaboration between Kim Jones and Raymond Pettibon, an American artist. The fierce looks shown were to be expected of Dior. The runway was heavy on blacks, grays, and browns – perfect hues for fall. The show took place in a large black tent at the base of the Eiffel Tower. A soundtrack of Daft Punk songs played as models walked down, modeling black leather jackets, blazers, sweaters, and more. There was such an array of showings, but there were certainly a few standouts, particularly the Celine show, which, as noted, was the most buzzed-about before it even happened. The Guardian reported the week’s highlights to include, of course, Celine, as well as Loewe (with Jonathan Anderson at the helm, showing in the Unesco building), Dior, Raf Simons (in what was his first solo show since leaving Calvin Klein), Ami (which dripped of Parisian moods), Dunhill, Junya Watanabe (who remarkably used solely silver-haired foxes/models – an unusual choice for high fashion, though a welcome one), and, Dries Van Noten.